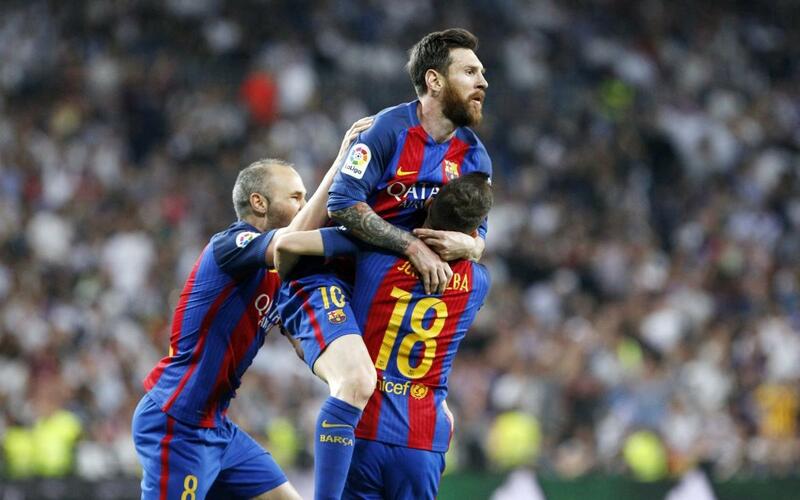 FC Barcelona left it as late as they possibly could but it was worth every gruelling second as Leo Messi popped up deep into injury time to seal an epic 3-2 Clásico victory to move level on points with Real Madrid at the top of the table. Ahead of the game, Luis Enrique described it as “a final” for his men, and the scenes after Messi’s strike resembled a trophy-winning moment. The team dug deep to breathe new life and optimism into the title race in the most dramatic of fashions. There was a never-say-die attitude from Barça, as they first came from behind to go ahead in the second half, before a late Madrid leveller looked like the points had been taken away from them, but Messi, as ever, appeared at the crucial moment to earn a priceless win. Either side’s no.9s had half-chances early on, in just a taster of what was to come in terms of attacking action. First, Karim Benzema got on the end of a Luka Modric through ball but his tame effort was not enough to trouble Marc-André ter Stegen. And immediately at the other end, Luis Suárez had a sight of goal after Paco Alcácer’s knock-down but the Uruguayan’s strike skewed wide. Cristiano Ronaldo then brought out a good save from Ter Stegen, as the Portuguese forward cut in from the left and hit a powerful goalbound strike. There was little the German could do about the eventual opener however, as his punched clearance from a corner fell to Marcelo who swung in a cross to the far post. Sergio Ramos, as ever, was on the end of it with a hooked strike which found the post but the rebound fell kindly to Casemiro who tapped into the empty net. It was a test of Barça’s character, and one that was passed with flying colours as Luis Enrique’s men conjured up a leveller just five minutes later. Messi received the ball on the edge of the box, jinked inside a small army of Madrid defenders before slotting coolly past Keylor Navas for 1-1. The strikers tend to grab the headlines in such games but it was the goalkeepers who stood out in the second half. A marvelous star-jump stop from Ter Stegen at one end to deny Benzema’s effort was quickly followed up by two super saves from Navas to stop Alcácer’s toe-poke and then Gerard Piqué’s bullet header. With Barça going for the win, Madrid looked to exploit on the break and almost did so when Marco Asensio squared across goal for Ronaldo, but he scooped the ball well over the bar. But for all of Navas’ fine saves, there was simply nothing he could do on 73 minutes when Ivan Rakitic unleashed a thunderbolt from well outside the box with his left foot to hand Barça a 2-1 lead. The precious victory looked all the more likely when Sergio Ramos was given a straight red card for a two-footed lunge on Messi. Despite the man disadvantage however, Madrid clawed themselves back level with just four mintues to play through James Rodriguez’s near-post strike. But drastic times call for drastic measures, as do big moments require big players, and there is nobody greater in the game than Leo Messi. With just seconds remaining, Sergi Roberto embarked on a super run before laying the ball off to André Gomes, who then teed up Jordi Alba on the wing. The full-back picked out Messi all alone inside the area, and there could only be one result: a sweet strike nestling into the bottom corner to hand Barça an invaluable three points. With his 500th goal for the club, Messi helps put Barça level on points with Real Madrid, with the Catalans holding the slight advantage due to the aggregate score of the games between the two, but with Zinedine Zidane’s men having six games left to play, one more than Barça.